There are 169 members in the International Softball Federation Hall of Fame, representing 32 countries. Voting is done at the ISF Congress, which is held every other year on the odd year. The unending efforts and true commitment of Dr. Dashrath Mal Mehta has been aptly recognized by awarding him Hall of Fame which is World's highest award presented by ISF for his lifelong services for the promotion and development of Softball game in India. Dr. Dashrath Mal Mehta - The founder of the Softball Association of Asia during his long unblemished career had organized 22 national tournaments for men and women. Led the drive to make softball a part of the school program and is aptly called the father of softball in India. He was the first person from India inducted into the ISF Hall of Fame. Certificate of Recognition by ISF : The following voluntaries of Indian Softball has been awarded ISF Certificate of recognition for their devoted contribution towards the development of softball game in India. 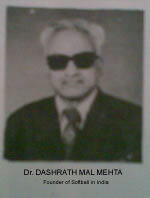 Dr. Dashrath Mal Mehta -- Raj. Shri Ranjeet Chand Bhandari -- Raj. Shri Prema Ram Chaudhary -- Raj. Shri Narendra Kankariya -- Raj. Shri Ram Lal Waghry -- A.P. Shri P.C. Dubey -- A.P. Shri P. Kamlakar -- A.P. Shri Kaidar Nath Panwar -- Raj. Shri Pravin Anaokar -- M.P. Shri Raj Kumar Sehgal -- M.P. Shri Pradeep Narulkar -- M.P. Shri P. Rajkumar -- T.N. Shri L.R. Mourya -- U.P. Shri Shrikant Thorat -- M.P. Shri Laxman Singh Gehlot -- Raj. Shri Surat Singh Kalete -- H.P.